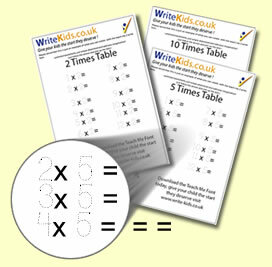 Do you want to teach your child how to multiply s.
..are you tired of making times table worksheets or does it take too long doing by hand, the Teach Me 2 multiply printablesworksheets, makes it so much easier for you, and in doing so will help you give your loved one the head start they deserve, as well as having fun at the same time. 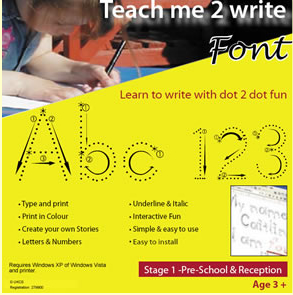 Once you have downloaded the worksheets you can print unlimited pages of dot to dot text. helping your child to forn the numbers correclty, or you could even liminate them. 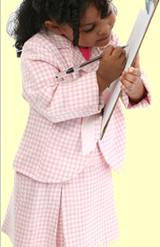 The worksheet have blank answers for your little one to complete. you should also cinsider the Teach Me to Write Font, lets you create uppercase, lower case and also numbers( so yo can create your own times table worksheets) the font creates dotted letters with a starting point for each stroke of the letter and a direction arrow indicating the direction of the stroke. you can change the colour of the text you create, click on the Free sample link below download some FREE sample worksheets. Once you have downloaded the worksheets a folder will appear on your desktop then simply follow the instructions and you will be ready to create your own worksheets in no time. you will need adobe reader which you can download for free if you do not have it installed. Individual pages can be laminated so you can use again and agian. Dotted text helps to practice Numbers.